At The Abbey Coffee Co., Roastmaster Levi McClish is growing his coffee community beyond his small town —and encouraging others to expand their coffee horizons. On Oct. 21, The Abbey, with the Indianapolis League of Lattes, will host a Smalltown Throwdown with a grand-prize trip to Guatemala. In 2012, Chris DeMarse began roasting coffee in small batches, in his garage in Marion, Indiana. It wasn’t a very popular or common pursuit. After sharing his coffee with encouraging friends, he felt compelled to bring specialty coffee — respectfully sourced and carefully roasted and prepared — to his community. Something about the effort, and the intentionality with which he went about it, felt monastic. 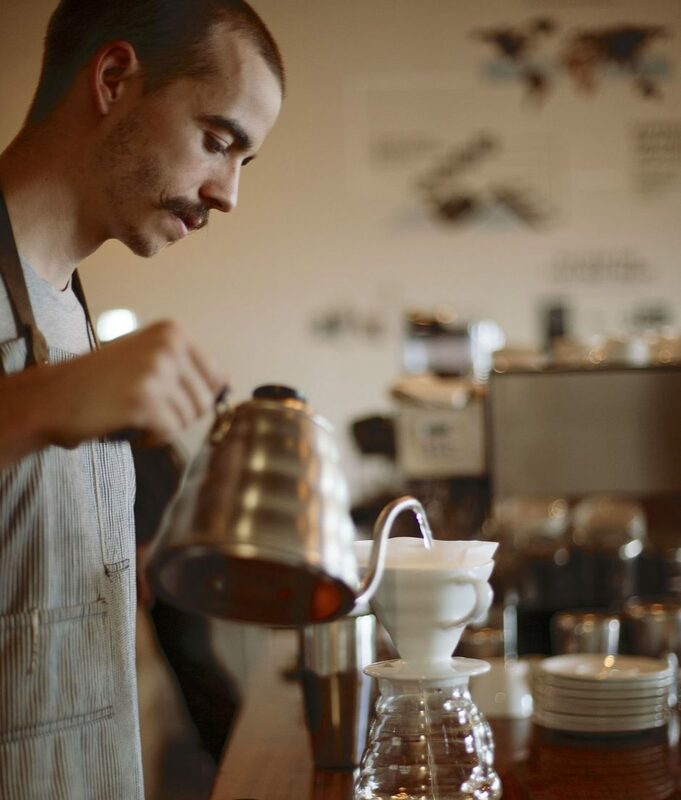 In a nod toward that feeling, in 2013 he opened The Abbey Coffee Co.
“We’re doing really nice coffee in a great space, in a small town that otherwise has very few nice things,” says Levi McClish, now the roastmaster at The Abbey. 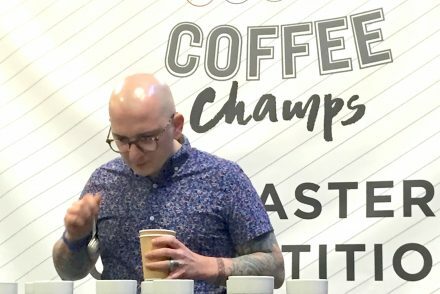 Levi McClish, roastmaster at The Abbey Coffee Co.
McClish began working in coffee six or seven years ago, as a barista, and became “obsessed” with latte art. “That was my thing,” says McClish. “I was super dedicated to my bar work, and I was traveling on my own dime to competitions.” In small towns, with small populations, it’s a way to meet people with common interests, he explained. McClish still does some consulting work, “with milk texturing and espresso,” helping baristas. Last year, McClish and The Abbey played host to their own throwdown. On Saturday, October 21, they’re doing it again — and even bigger. 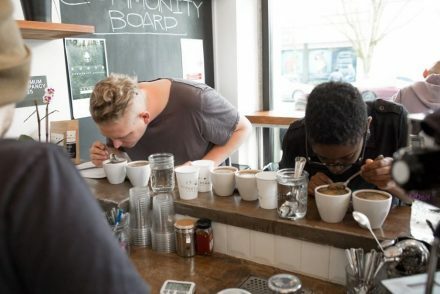 The Abbey Coffee Co. has teamed up with the Indianapolis League of Lattes and will host Smalltown Throwdown, a competition tied to more than $2,000 in prizes. The Grand Prize, we’re thrilled to share, is a trip to visit the Genuine Origin team in Guatemala, Feb. 4–8, as well as the buy-in cash pot and some great swag. “GO is pushing this thing to a whole ’nother level,” says McClish — who has, with characteristic attention to detail, put together what’s sure to be an outstanding event. The Abbey and the League of Lattes proudly present: Smalltown Throwdown. Food trucks will begin arriving at 6, and the main event and first pours will kick off at 7:30. “I love my coffee friends and I love putting on a good party, building community and introducing the weird coffee culture that I adore to new people in my town,” says McClish. Smalltown Throwdown will take place Oct. 21 from 6–11 p.m. Throwdown participants can register in advance at this Eventbrite site, run by The Abbey. 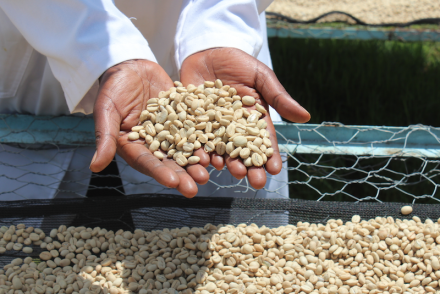 The dates of the visit to Genuine Origin in Guatemala are Feb. 4–8 and are inflexible. If the first-place winner is unable to attend, we’ll extend the invitation to the second-place winner.